Questo non è un momento facile se fai parte dei corpi speciali USA . La guerra al terrore ha portato questi super-soldati a carichi di stress altissimi e a vivere un'unica missione continua che può portare a 10 turni all'estero in 12 anni di attività. Il tasso di suicidi ha raggiunto, nel 2013, il record di 49 vittime ma nonostante questo il numero di volontari desiderosi di conquistare la gloria che questi reparti rappresentano e' raddoppiato. Frustrations with the never-ending U.S. war on terror are mounting among the country’s elite fighting forces. These top-level troops—called special operations forces—are fraying at the edges after more than 13 years of near constant deployments, according to public comments by current and former leaders at the U.S. Special Operations Command (SOCOM). Now, as the U.S. is poised to broaden its offensive against the Islamic State (better known as ISIS) in ways that will undoubtedly require a heavy presence of special operations forces, there are serious questions about whether waging a war without end is sustainable for these go-to fighters. Special operations forces come from all branches of the military and include groups like Navy SEAL Team 6, the unit that killed Osama Bin Laden, as well as Army Rangers and Marine Reconnaissance teams. Operators, as they’re called, are reportedly working in up to 80 countries on any given day, and they’re tasked with carrying out the military’s most secretive and specialized missions, including assassinations and training foreign troops—the chief job of the 300 special operations “advisers” President Obama sent to Iraq this summer. 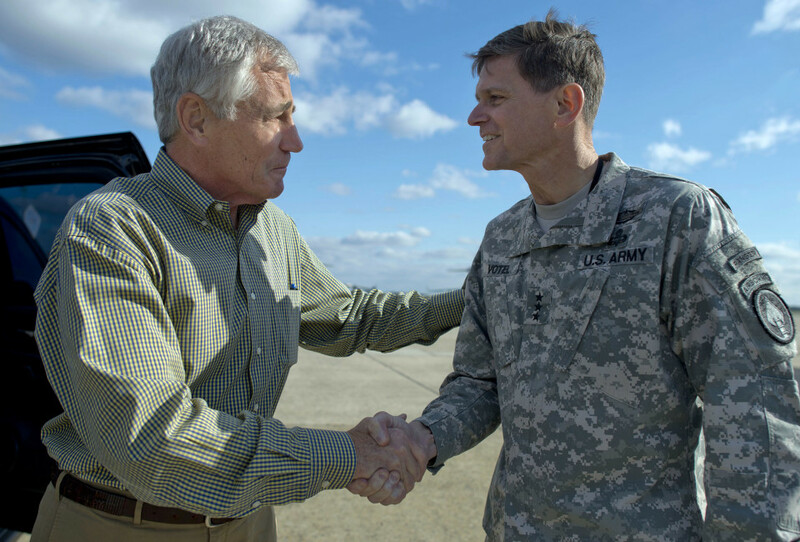 Secretary of Defense Chuck Hagel with Gen. Joseph L. Votel, the newly appointed commander of U.S. Special Operations Command. The constant demand for special operations forces since 9/11—not only in Afghanistan and Iraq but also in Africa and Asia—has resulted in near constant deployments, with some operators serving more than 10 tours of duty in the past 12 years. The hectic deployment schedule has taken a toll, admits the newly appointed commander of SOCOM. “SOF members are subject to no-notice recall and immediate deployments without clear end dates which adds unpredictability to the families,” Gen. Joseph Votel said in written testimony before his Senate confirmation hearing this summer. 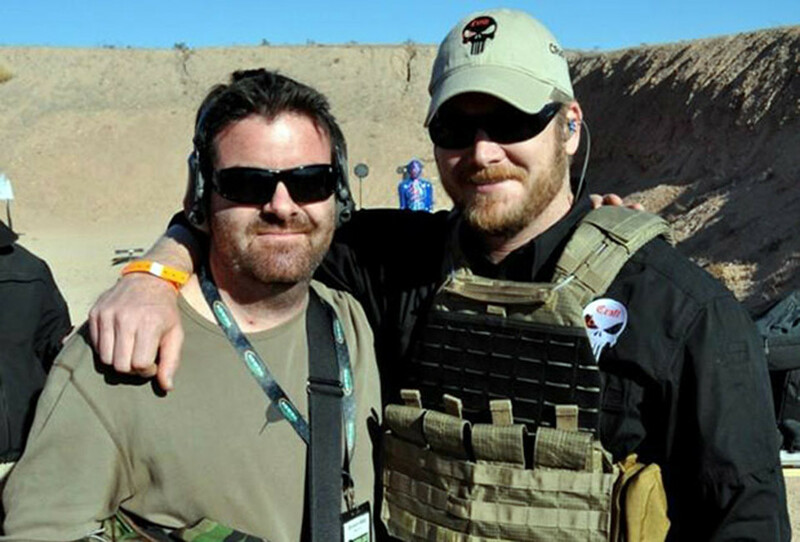 Former Navy SEAL Brandon Webb, right, with the late SEAL Chris Kyle, author of American Sniper. And some operators believe the compensation isn’t worth it. “A big issue that drives a lot of great guys out of the community is that they aren’t getting paid enough,” says Webb. The average annual salary for a Navy SEAL with over 12 years of experience is between $50,000 and $60,000, though that amount can increase based on hazard pay and re-signing rewards, which serve as only a temporary fix for troops. “Bonus programs don’t offer long-term stability,” notes Webb. As a result, he says, “you have a lot of guys getting out at the 10-year mark when they realize their retirement package is not very attractive.” Losing operators to retirement at 10 years is a big problem, as a Navy initiative in 2011 stated that keeping experienced sailors in the service for 20 years is necessary to ensure highly functioning special operation units. A SOCOM spokesman says, “Generally, special operation units have high retention rates,” and data provided to Vocativ by the Army doesn’t show a clear pattern of early retirement among that branch’s special operation forces. But a recent unofficial survey conducted by a Navy commander paints a bleak picture: “ marked the worst year in history for the special warfare community, with record numbers of lieutenants declining to stay for the next pay grade,” the survey notes. 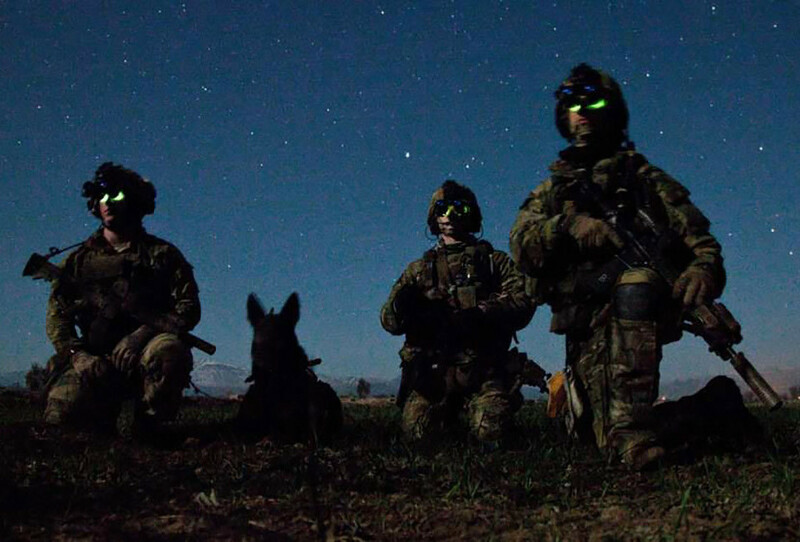 Army Rangers and their canine during a nighttime combat mission in Afghanistan. Another consequence of 12 years of war for special operations forces is a sharp increase in post-traumatic stress disorder. Suicide rates among operators hit an all time high this year, according to outgoing SOCOM Cmdr. Adm. William McRaven. And The New York Times reported earlier this year that “[i]n the past two and a half years, 49 Special Operations members have killed themselves, more than in the preceding five years,” even as suicide rates in the rest of the military have decreased. Part of what’s fueling the trend is how operators face physical and emotional trauma that many other troops don’t. One example, the Times noted, is “breacher’s brain”—the result of being exposed to thousands of small explosives used to “breach” buildings. Finally, specials operations units—the very definition of unconventional forces—face another challenge: becoming conventional. SOCOM oversees roughly 70,000 operators, support units and civilians, a jump from 33,000 in 2001, and its budget has grown from $2 billion in 2001 to more than $10 billion. With that expansion comes bureaucracy. “SOCOM is a victim of their own success,” says Webb, the former SEAL. 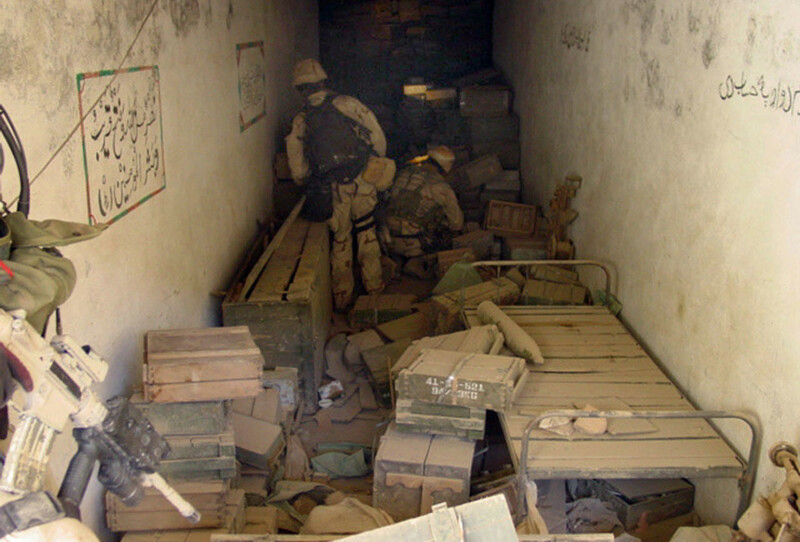 Navy SEALs discover a large cache of munitions during a search-and-destroy mission in Afghanistan. Despite the downsides, there’s no shortage of troops willing to volunteer for special operations training, lured by the glory and the signing bonuses. But for the few troops now asked to do the majority of America’s fighting in the “war on terror,” the pressure isn’t likely let up anytime soon.